Jubilee. In early 2011, Terry was chosen by the Federation of British Artists to exhibit at the Mall Galleries in London to commemorate their 50 year anniversary exhibition, 'PURE GOLD'. 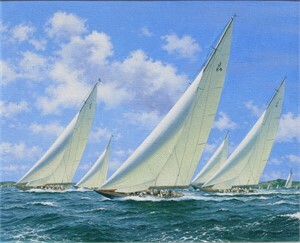 Terry Bailey is best known for his paintings of yachting scenes, both contemporary and historical. 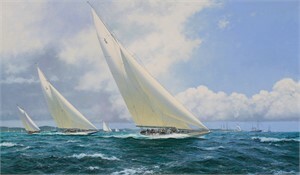 He has won many awards and his work has appeared in several maritime magazines. 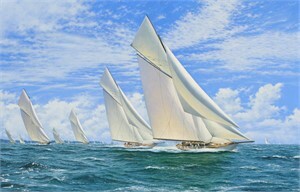 In these, particular attention has been drawn to his mastery of detail and his ability to portray a sense of action and movement, within truly convincing seascapes. In addition to this accuracy, his clever use of light and colour helps to bring the scenes to life and make the paintings truly beautiful. Terry lives just a few miles from St Mawes at St. Just in Roseland, Cornwall. Jubilee. In early 2011, Terry was chosen by the Federation of British Artists to exhibit at the Mall Galleries in London to commemorate their 50 year anniversary exhibition, 'PURE GOLD'. 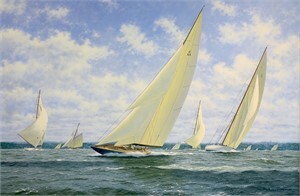 Terry Bailey is best known for his paintings of yachting scenes, both contemporary and historical. 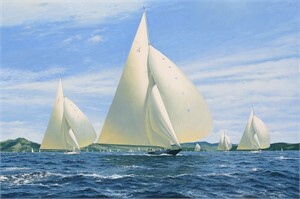 He has won many awards and his work has appeared in several maritime magazines. 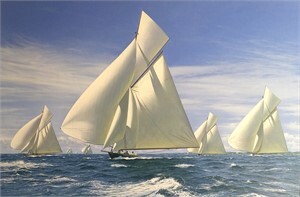 In these, particular attention has been drawn to his mastery of detail and his ability to portray a sense of action and movement, within truly convincing seascapes. In addition to this accuracy, his clever use of light and colour helps to bring the scenes to life and make the paintings truly beautiful. Terry lives just a few miles from St Mawes at St. Just in Roseland, Cornwall.